The one thing that every family in the 1930’s Dust Bowl savored for Christmas was an orange. In our own culture of entitlement and excess, the thought of one orange constituting the holiday pay load is unimaginable. But getting an orange was a big deal because citrus fruit wasn’t affordable during the rest of the year. Tom Heck, a Wisconsin dairy farmer, shares how his mother was so grateful to get one because she “knew that her parents had sacrificed to buy the oranges.” Like all children, she hoped that a banana, nuts and candy would be stuffed into the stocking, also. 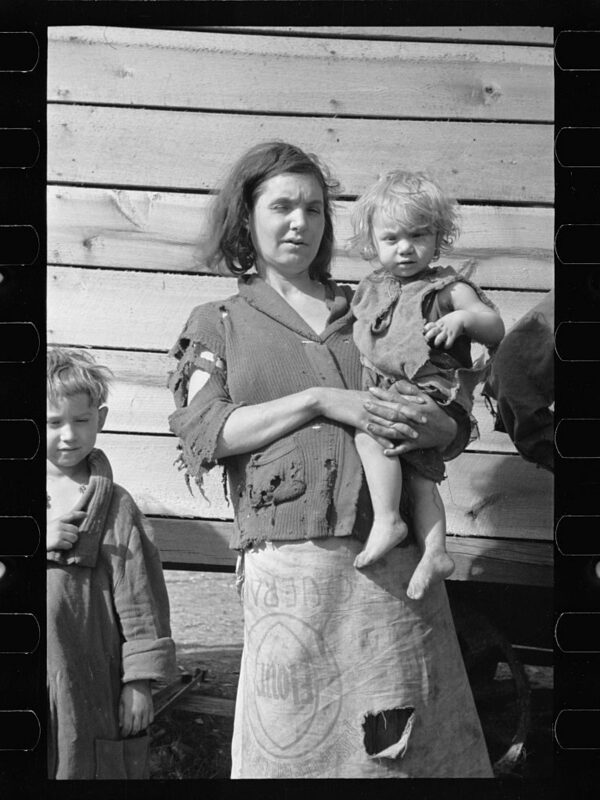 The Great Depression lasted ten years with over 25% of the work force without jobs. The middle class became poor, but the poor drowned into desperation. Soup kitchens and bread lines sprung up in every city. With necessities barely in reach, gift giving required imagination. Flour sacks were saved to stitch a dress for girls or an apron for a woman. Boys and men received knitted scarves and mittens. Underwear or socks purchases provided a practical present. Homemade soap was popular. Wrapping gifts pushed frugality. Year after year, the same wrapping paper enclosed presents, forcing the recipient to carefully lift tape, remove the paper and fold it for next year. If the paper showed wrinkles, a gentle iron flattened it out. The colorful Sunday comics supplied a stack of wrapping that could be ripped off. The white paper from the butcher allowed a background for potato stamping or attaching cut outs with flour paste. Attractive packages emerged from creative hands. For those who brought small trees or tumbleweeds into the home to decorate, paper chains from catalog pages, wooden carved ornaments, or pine cones made the Christmas trees festive. The tree created a focal point for the card playing, singing, and eating of the traditional chicken dinner with the relatives who gathered for fellowship after church services. The real significance of the holiday rested in the hope represented by the coming of the Babe in the manger. 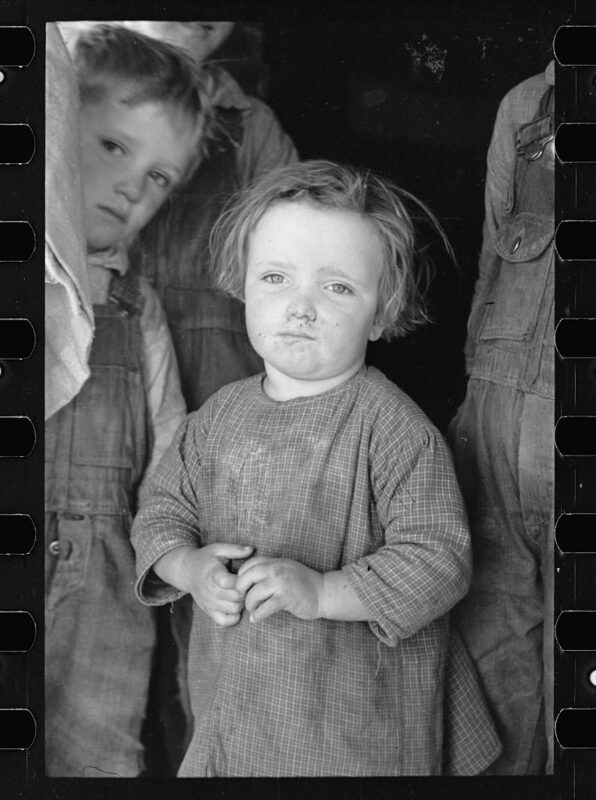 As the children of the Dust Bowl grew up, what they remembered best were their extended families, fun, and togetherness; not the gifts, trees and tinsel. They didn’t have much as children. But, maybe, they had much more. As a high school student in Texas, Beverly Roberts Jostad worked with her home economic classes to make new dresses for some pre-loved dolls. The shop classes turned out toy trucks and games for children. Then the students distributed the gifts to needy families. Beverly wasn’t prepared for the last delivery of small packages and a box of groceries. Barely a shack, the students approached the dwelling with smoke rising from the stack. A young woman opened the door with a girl of 2, and boys perhaps 4 and 5 years old peeking around her skirt. They entered at the woman’s invitation. Beverly tells the story. “I knelt to reach the little girl. The linoleum floor was worn but spotless. Bleached flour-sack curtains hung at the windows. Neatly made beds occupied one corner of the room and the kitchen another. A small stove furnished heat. As I turned to the children, dressed in clean, neatly patched clothes, I noticed several green tree branches standing upright in a dirt-filled pot. A red cloth circled the base. Can lids and paper angels hung on string and a tiny paper star graced the treetop. Streamers of popcorn completed the decorations. The room was silent as the children looked at their mother, wondering if the gifts were really for them. The little girl hugged the doll and the boy grasped the trucks as they sought an answer. The mother put her arms around them and said in a choked voice, ‘I told you Santa Claus would come.’” Beverly still tears at the memory of that family. An orange in a stocking. It was enough. It was everything. 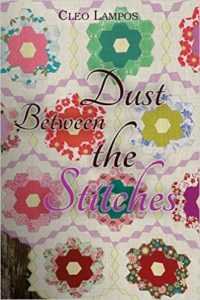 The historical fiction, Dust Between the Stitches, tells the story of Addie Meyers as she tries to save the family homestead from foreclosure while teaching in a one room schoolhouse for script. 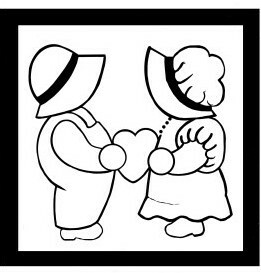 Each chapter of the book starts with a quilt pattern, many of them based on Sunbonnet Sue and Overall Sam. A picture of life in the Dust Bowl emerges in this novel that will warm your heart and inspire your faith. 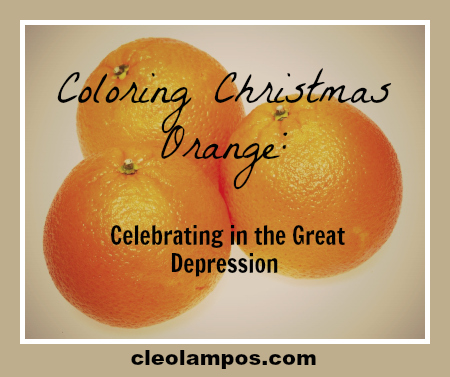 Christmas, Dust Bowl, Great Depression, Greatest Generation, oranges. Bookmark. This is such a moving, Cleo! My parents lived through the Depression. It did not touch my life, except through an orange in my stocking each year and the huge cast iron kettle once used for soap making that became a flower planter in my parents’ yard.